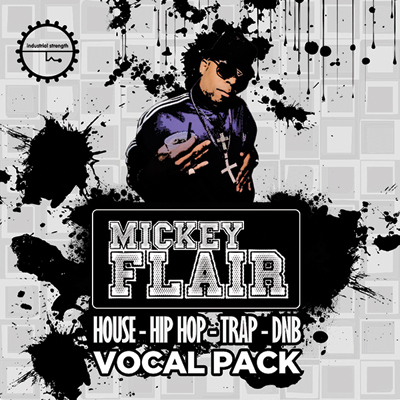 Give your productions the voice no one can mess with---dynamic MC Mickey Flair unleashes undeniable L.A. Style in this rugged vocal pack. Produced to perfection by studio master 6Blocc, these rough and dirty vocals clips play cool while sending any track to the edge. Industrial Strength Samples presents an energetic acapella soundset to shatter the dance floor. Mickey Flair lays down the dirt. Known for his sharp, stinging lyrics, rugged voice, and brilliant gap-toothed smile, the MC's slams and shouts are sorted into ample samples for Trap, Hip-Hop, DnB, and House. Produced by Los Angeles legend 6Blocc, these 24-bit, 44.1-kHz audio files are as stylish as they sound---We present them to you format-free, license-free and ready to layer into any audio situation. Master of Ceremonies Mickey Flair has been stirring up the scene in Southern California since the early '90s. As an active promoter and performer, his Hip-Hop influences shine through with earnest, raw delivery and the drive that pushed his persona to the forefront of L.A.'s underground Drum and Bass scene. Flair's vocal momentum gathered speed as he took to San Diego and beyond, touring and ripping it up nationally at events and festivals, and sharing the stage with the scene's heavyweights including R.A.W., DJ Hive, DJ Aphrodite, and DJ Craze. These sounds were expertly captured and polished by 6Blocc, the man with the chops that twisted remixes of Fugees, Dr. Dre, Method Man & Redman, and Bone Thugz n Harmony. 6Blocc has been heard collaborating with Snoop Lion, Major Lazer Cypress Hill producer DJ Muggs and San Fran's Bassnectar. On top of running his 6DUB label, his recent releases can be caught on Foul Play, Ultra, Terminal Dusk, Moonshine, Mad Decent, and Lo Dubs. If you're looking to set these vocals dancing across new ground, check out 6Blocc's series of bold sample packs: West Coast Trap, Dirty Alley Drumstep, Future Jungle, Dubstep Ammo, Footworks and Hard Talking are bursting with original drum sounds, bass riffs, top loops, and raucous effects to keep the party going. Some of the sound bites in the demos tracks are from his amazing sample packs. Fearless Mickey Flair is here to shout it loud and clear. Grab these vocals by the throat and twist em into your tracks.